On December 23, 1938, a murder during a robbery in Millionaire's Row shocks the families. Louis Sheridan was a socialite and left behind his wife, two sons and infant daughter, who was looked after by Ellen O'Malley, who had previously experienced loss herself. Over the next five decades, the Sheridan and O'Malley families are linked together not just by this tragedy, but by friendship and guilt as well. 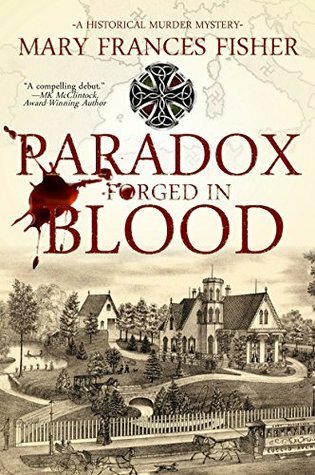 Paradox Forged in Blood is a debut novel and is based on stories handed down within Mary Frances Fisher's family. As a result, we follow the different families through the decades prior to and past the Sheridan murder, getting to know the family members. This helps us to understand the motivations for everyone involved. 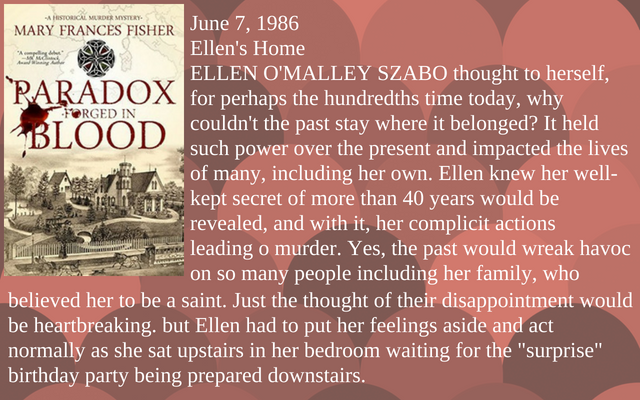 Because Ellen witnessed her infant brother's kidnapping, she would do anything to keep her family safe, even if that means keeping silent about clues that would lead to the murderer. We get flashes of the killer's thought process intermittently, which actually points us in various directions as to his identity Everything is revealed at the end of the book so that the families are able to get some kind of closure. There is some tension in several parts of the book, but this is not a thriller. The identity of Louis' killer is a mystery, but hardly the central focus of the book. There are more characters and side stories besides that of the Sheridan murder, which drops the tension level. We do care about them, and it's wonderful to see what happens with Sadie and the Sheridan boys after the heartache they experienced as children. This is a book more for those that love historical fiction or family sagas. Sounds like an awesome debut. Thank you for explaining the genre, because the cover kind of makes it look like a thriller. I do enjoy family sagas and this time period. Sounds like this is a good one. It's an interesting read because of how their family is influenced by history. I'm generally up for a good family saga. That does sound interesting. But it does look like the publisher is hoping for a mystery audience as well, and that's OK by me! It's a really interesting family saga given the time period, too!